The organic revolution is upon us -- let these fresh, modern, and inspiring sourcebooks be your guide. Fresh, additive-free natural foods are essential for the healthy development of all children. 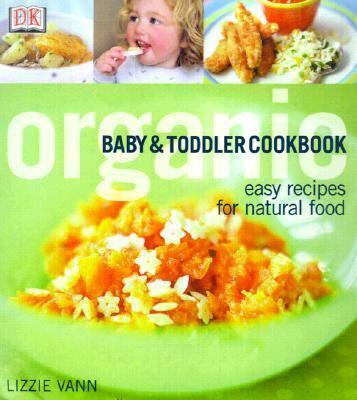 Now every parent can prepare tasty and nutritious meals with the Organic Baby & Toddler Cookbook. Why Choose Organic Food? Babies in the womb and young children are particularly vulnerable to the harmful effects of pesticides, additives, and genetically modified ingredients in food. Lizzie Vann, founder of Baby Organix in the UK, a pioneering organic babyfood company, explains how to avoid these dangerous elements, including helpful tips on deciphering food labels and identifying the most harmful additives to avoid. She also gives advice on where to shop for organic products and what organic staples to buy. Easy and quick recipes and menu plans are carefully adapted for each stage of your child's development. Each section outlines essential superfoods for each age stage and provides appetizing recipes for healthy, satisfying meals. From fruit purees for our baby to healthy snacks and independent food choices for the toddler, there is food here that the whole family will enjoy. Advice for vegetarians and children with special dietary needs is also featured. Organic Baby & Toddler Cookbook explains the benefits of organic food for you, your child, and for the environment.Vann, Lizzie is the author of 'Organic Baby and Toddler Cookbook' with ISBN 9780789471901 and ISBN 0789471906.